"Hi Nick, I just wanted to say thank you so much for last night. You blew everyone away and are the talk of the conference. Of course, every opinion counts, but some more than others and Richard, the sceptic, has apologised to me for being negative and has said how amazing you were! He is the Simon Cowell of the University!!! So, thanks for living up to your online reputation and I really hope you get more business through our event … Well done! "Hi Nick ... I just wanted to email you to thank you for entertaining our guests at the Charity Event on Friday. You amazed so many of our guests and they had nothing but great feedback to give me once you had performed. Thank you for your generous donation you made on the night and once again if we do have any events in the future I will be sure to keep you in mind to dazzle our guests once again. Thanks again Nick and have a lovely week! Rebecca Chauhan - Charity Event for Futura Design Ltd.
"Hi Nick, It was lovely to meet you and see you at work! I will of course keep you in mind for any future events. Kind Regards Katie"
"Good Evening Nick , You were amazing and everyone enjoyed the magic ! See you at our next occasion ... A BIG THANK YOU ONCE AGAIN ! I will get some feedback on your Facebook page as all the guests were very impressed very professional ! Keep in touch "
"Hi Nick ... we had such a greate evening on Wednesday night – we all loved both the magic and the caricatures! I will certainly pass on your details to my colleagues in HR who organise the HO staff Xmas party and give you a great recommendation! Thanks once again – you made the night very special! Kind regards "
"Hi Nick, I'm just emailing to say an enormous thank you for your work last night. You were absolutely outstanding! The kids loved you, as did I - I still have no idea how you did that card trick with me! You were also a real class act to deal with. You will get my absolute highest recommendation to anyone looking to hire a magician in future, as I really could not have been happier with you. Thank you. All the very best, Jon"
"Hi Nick A big thank you for the entertainment . We were very pleased with the night and had some lovely comments from people about how you impressed them. We feel that it made a good night turn into a memorable and great night. It was a good start to the hopefully successful business of letting out Hideaway! I am sure we will see you about, Thanks again Regards"
"Nick - we've had no end of excellent comments from the guests and staff about your visit; we couldn't be more pleased. We'll be sure to keep your details and will be in touch no doubt in the near future. Best wishes, "
"Thanks Nick for the last 2 days, was great work on your part and surpassed my expectations. Will be booking you again for sure. Cheers Chris"
"Good morning Nick, Just a quick email to say thank you for Friday night. You kept everyone well entertained and we have heard nothing but good feedback. We hope you got home safely after the party. Thank you again"
"Hi Nick Thanks for your email. It was a great evening which was enjoyed by everyone. I am on holiday today but have received an email with positive feedback …. Just wanted to say a big thank you from all my team for organising the party on Friday – we all really enjoyed it – especially the magician! I will drop you some feedback on Facebook. Thanks again…..you really helped to make our party a success. Much appreciated. " "Hi Nick, I just wanted to drop you a quick email to say thank you for Friday night. Everyone was so impressed and still discussing it in the office this morning! I would say karaoke is definitely off the menu from now on and I will be saving your number for next year! Have a lovely Christmas and New year. " "Hi Nick, Thank you for coming to such a small audience, we thoroughly enjoyed it and it was definitely the topic of conversation for the evening trying to work out how it was done. You always think that when it is done so close to you that you will see some glimpse of it but I have to say not got a clue!! I will definitely keep your details for any future events be it business or personal. I hope you have a lovely Christmas. Kind regards "
"Hi Nick Guest reactions were great and we also enjoyed the night very much, will try and do something again next year if possible, again many thanks. Regards"
Thanks so much for Friday. I've had lots of positive feedback from everyone who really enjoyed your magic. We have lots of photos. Once we've had time to sort through them we'll sort out a CD for you and pop it in the post. Thanks again"
"Thanks Nick Im sure we will be in touch again in the coming months – well done and thanks again Kind Regards"
"Thanks Nick, good feedback and enjoyed by all!! "Hi Nick, Well I'm hearing nothing but praise for you in the office this morning! You certainly impressed everyone and I've already been asked to pass on your contact details to 2 people who want to hire you for their weddings! Thanks very much Nick for such brilliant entertainment - amazingly talented! Kind Regards"
"Dear Nick Thank you very much for entertaining the guests at the Leek show, we all really enjoyed the magic and it was lovely to meet you. I am still baffled by the pound coin trick!! Kind regards"
"Wow , what can I say. I knew you would be good but to be honest I along with all were blown away by how good your magic is. It really added something special to the night , especially for the students . Their reactions were fantastic !! ... Nick , could not of asked for more. I am glad you enjoyed working with Barclay ... If you are available for the same event next year we will book you in now." "Hi Nick The feedback was great, thank you very much. People are still talking about it at the school gates this morning! Kind regards"
"Hi Nick ... We all had an amazing time on Friday- everyone is still talking about it today! ... Formal testimony for your website to follow as the couple of lines above don’t quite do it justice. Thanks Kathryn"
"Hi Nick Sorry its taken me so long but wanted to say thank you for entertaining us all on 1st December. The night went very smoothly and I appreciate your part in that. Everyone was still talking about your tricks days after and also about how you were not pushy and gauged the crowd well! ... Thanks again Nick." "It was lovely meeting you and everyone enjoyed your magic. There has been some really good feedback on the magic and people are still amazed today on how you did it! We all enjoyed it and thought it was brilliant. thank you for coming. We are defiantly keeping you in mind for future events and will recommend you in any future events. As I say, it was a pleasure meeting you and hope to see you again. THANK YOU Sammy"
"Hi Nick Thank you so much for attending our evening. The feedback was total amazement at what you were doing and although some of the guys mentioned they had used magicians at various other functions, they rated you as the best they had seen! Would definitely recommend you to colleagues and family and if we have another function will certainly be in touch. Kind regards"
"Many thanks for your excellent entertainment on Thursday night - your magic tricks were the topic of conversation for the remainder of the meal at our table, especially the one with the invisible pack! Once again, many thanks." "Hi Nick, thanks again, everyone afterwards were saying how good you were and how fab the evening was. Will keep your details and pass on to people that ask. Take care"
"Just wanted to send a quick note to say thanks so much for doing such a great job on Saturday night. You were fantastic! Everyone was suitably impressed. I was really pleased to have the opportunity to book you again. Thanks again"
"Dear Nick, I would just like to say a huge thank you for the wonderful entertainment you provided at my recent charity ball. It was the talking point of the evening , how you had done the tricks!!! It will hopefully be an annual event and we would love to use you again-please. I raised £9500 profit on the night -way beyond my expectations. Many thanks kind regards"
"The feedback was all excellent! Everyone was very impressed, especially those who were “helpers”! I will definitely let you know if I get anymore requirements! Once again, many thanks"
"Hi Nick. Once again, we were all amazed at your tricks. The evening was a great success and everyone enjoyed themselves. Hopefully, we will be able to use your services again in the future. Kind regards"
"It was a real pleasure working with you (Homes 2006 Exhibition in Harrogate). Thanks for all your help." "Thanks so much for working for Philips at the two events this year, you really added something special to the stand and attracted and kept people there, which was exactly what we wanted." "We had lots of great feeback, so thanks so much for working so hard on the stand at UKRC (UK Radiological Congress Conference and Exhibition). It was good to meet you at last, and I will of course be in touch if we need entertainment at any future events"
"Dear Nick, I just wanted to say a huge thank you for coming on Saturday. I am sure you get this all the time, but everyone loved you and thought you were amazing. Hopefully I will be organising another ball next year - so I hope you will come to another College of Law ball! Thanks again"
"When I say to attendees: “Wasn’t the lunch lovely?” Everyone says yes, but the magic guy was superb. Can I really say more - other than I totally agree. A further accolade is that Jonathan Allen, who recommended we use you for the lunch, would not have done so if he had not been impressed by a previous performance. Finally, I feel the only thing left to say is thank you from everyone here at Estech Europe Limited for providing such an excellent service and to confirm we would have no hesitation in utilising your services in the future." "A big thank you is owed. It was a fantastic display and you handled the merry and tipsy masses with superb professionalism. The delivery was just as fantastic as the magic and combines together created a display that was even better than our already high expectations. The whole mood of the evening was infinitely better than the party of the previous year and everyone thoroughly enjoyed themselves and have many ‘thank you’ emails back where in previous years may have only had a couple. We were all talking about you (in a nice way!) long after you departed." "Just to thank you once again for entertaining us on Saturday night. enjoyable evening. Thanks again and hope you have a Merry Christmas and Happy New Year!! Best Wishes"
"Hi Nick, Everyone was very impressed with you superb magic!! Thats all I heard about on Friday morning was how fantastic the magician was - thanks very much. Will definitely be keeping you in mind for future events. Regards"
"Hi Nick, Just a quick e-mail to say thank you for putting on a great show (Betting Show 2006, NEC). Our customers and staff thought you were excellent you added a lot of appeal to our stand. Kind Regards"
"Hi Nick -we had a great time, and you were the success of the show (The Betting Show 2005, NEC) - wouldn't hesitate to use you again in the future, and same time same place for next year if you're free??" be in touch for further bookings. Kind regards"
"I was truly amazed by your magic in the short time we spent together. So many guests came up to me on the night and said how fantastic you were and the family were full of praise. Many thanks, you certainly helped to make it a night to remember! Let's hope we get the opportunity to work together again soon"
"I have received some really good feedback on your performance and should we or anyone we know have the need to get some entertainment in the future we would certainly recommend you. Thanks again and all the best." "Hi Nick, Saturday went fantastic, people were amazed by you! We had a really good evening and my total is looking to be close to £15,000. Hope to repeat it again next year, hope you will be available!!" fantastic.... I am still recovering from one or two of the card routines you performed! The feedback has been excellent. I'm sure our paths will cross at some point in the future - I am already thinking about any future events where you will have an equal impact! Thanks again and best of luck in the future"
"Thank you for coming down to Petersfield on Thursday evening. Everyone has been extremely positive and complimentary about the whole event, but in particular your performance. They loved you!! They were all stunned and amazed at how you made coins appear in their hands and how the card they had chosen from the imaginary pack was the very one face up in the real pack of cards!! Thank you. I hope I can book you again very soon for some future events!" "Just to say an enormous thank you for entertaining us all so well yesterday. Having you do your fabulous magic was a great way to warm everyone up and get chatting. We do hope you will join us again, I know how busy you are so I will keep in touch with any future dates." "We had a great night and everyone was raving about you in the bar later in the evening, you amazed everyone and they loved your act. Even our managing director said that you were one of the best he has ever seen! I will have no hesitation in recommending you, and would definitely use you again for future events. Good luck and thanks again." "I have received nothing but wonderful praise for your performance on Saturday. Everyone is still talking about the amazing magic you performed. From my point of view, as the organiser of the event, you were extremely professional to deal with - you really did help to make the night a success! Whenever I organise any future events, I shall contact you - you can be certain of that. Thank you - truly professional and amazing." "Everyone thoroughly enjoyed your magic, you were outstanding and well received by all, and I know a few people took your details away for future reference. Thank you for entertaining us." "We were all impressed with your performance, and you helped make a great night. I hope you enjoyed the night as much as we did!" "...thank you very much for your marvellous entertainment at our evening diner last week. Your magic routine went down a treat and thoroughly entertained the delegates. From comments I received afterwards they were all clearly amazed..."
"Hi Nick, It's 1:00am o the Saturday and sooner than go home I had to pop in the office and mail you. The night was made by your work. Everyone will be talking about it for many weeks to come. Thank you very much and feel free to use me as a personal recommendation." "Anyone planning a trade show will find Nick Rushton's magic to be of the greatest importance for enhanced results and successful lead generation." "It was a brilliant and faultless performance..."
"Hi Nick, Just a quick note to thank you for your "out of this world" turn at Martha and Joe's Wedding bash this Saturday gone. You were astounding!! Guests could not believe what you were doing, they chatted about it well into the evening. Total amazement in all camps. Thank you so much for adding that extra piece of uniqueness to their wedding day. Kindest regards,"
"Hi Nick,Thank you so so much for coming on Saturday. You were so great and we've heard nothing but rave reviews from our guests ... I will be sure to send you photos as soon as we have them ... thank you once again and if we have any parties in the future expect a call 🙂 "
"Hi Nick! ... We were over the moon with your performance, worth every single penny and if I'm honest more! When my photographer send us the copies of the day I will forward (via email) any that have you in it, then you can pick the ones you want etc. I really hope we can book you again! We just have to wait for a event big enough,that being the only problem! Again so so happy with everything you did!Thank you"
"Hi Nick ... thanks so much for entertaining the guests on Thursday. Your magic went down really well! Hope to see you again soon! Kind regards"
"Thank you Nick for your really memorable magic performance. You said we would be pleased and amazed: we certainly were! We were up close and we couldn't see how you did it! Our guests loved it and made a point of telling us. Your style was friendly and professional just right for our party. The tricks were amazing. We would have no hesitation in recommending you. Also I would like to say how easy and efficient your booking system was. Thank you again. " "Everyone has been talking about you! They were amazed! I hear there are some really good shots too. Once I'm in receipt of those I'll send them to you too. I will definitely book you again ... It was a perfect day and you contributed to that. Thanks again, Sophia." Sophia Forrester - Christening Party @ The Harpur Suite, Bedford. "Thanks very much, Nick. You absolutely went down a storm, everyone was talking about you way into the night. I will certainly leave some feedback for all to see and should I have an occasion to use a magician again, I would have no hesitation in asking you once again. The very best to you for your future and I look forward to seeing the name Nick Rushton on TV one day also. Yes....we did have an absolutely fabulous wedding and you played an important part in that. Best regards." Mark and Michelle Harrop - Wedding @ Warwick Castle, Warwickshire. "Hi Nick, Just wanted to say a big "thankyou" for your fabulous entertainment on Saturday. It certainly was magical! We all thought it was just fantastic & have had many comments marvelling at your quick skills! Thank you so much for a great evening. Kindest regards. Sue"
Sue Langford - 80th Birthday Party @The Benn Hall, Rugby, Warwickshire. "Nick Happy New Year! Will's party went down a storm everyone loved your magic and are still talking about it and how you did it ha ha Many thanks again Hope to see you soon"
"Hi Nick, Thanks so much for Friday night. As I'm sure you know, everybody was knocked out by your performance. What a clever guy!! ... Thanks again for a great night and I'm sure you will get more bookings from family and friends just as soon as we have something else to celebrate! Kind regards, Sue"
"Hi Nick, we would like to say a very big thankyou for making our Ruby Wedding day that extra special with your fantastic display of magic tricks etc. My friend was astounded when you read her mind for the family name! Every one was still talking about you after you had left. We are still trying to comprehend what we all saw. Once again many thanks "
"Hi Nick, ... The feedback I got from my guests have been amazing!, They all said you were wonderful. So thank you ever so much! Infact a friend of mine is looking to get married next year and asked me for your details! Take care Selina"
"Hi Nick, On behalf of Steph, Andrew and myself I would like to say a big thank you for making our party so special. We had a great night and you were a fantastic surprise guest! The close up magic was incredible - slight of hand at it's best with such slick performance and delivery. Amazing. So many guests have commented on how you blew them away, and we spent Sunday talking about the magic and trying (and failing!) to work out how you bent forks and produced £20 from lemons!! The staff at the hotel were still talking about it today when I popped in and I have given them your details should future clients want a recommendation. I hope we have the privilege of being entertained by you again one day. With our thanks and best wishes"
"Hi Nick We both would like to say a massive thank you for attending our wedding you made our night -you were amazing!! The guests have not stop talking about you!" "Thank you Nick! You were absolutely brilliant yesterday and talked about among our guests all evening! We just don't know how you did any of it, it was truly magical!!!" "Hi Nick, thanks for the excellent job you did on Friday at Beth and Martin's wedding. You are very talented and everyone was talking about how good you were on Friday and also at the BBQ we had yesterday! You certainly made a good impression. Thanks again, Lesley. " "Hi Nick, Thank you so much for entertaining us and our family and friends on our wedding day. You were certainly a popular subject! I think my boss was even talking about booking you for our Christmas party! I will leave you a review through facebook, thank you again! 🙂 "
"Hi Nick, Well what a great day! and you were absolutely fab mate, people have been talking about you for the last few days, but I knew you would knock them out! It was so good just to see their reaction. Nice also to know you also enjoyed yourself. ... Again many many thanks for your services. Best regards "
Andy Reece - Wedding @ Briars Hall, Ormskirk, Lancashire on 20/06/2015. "Hi Nick, thank you so much for coming to our wedding at Hogarths on Saturday May 23rd. You were brillant everyone is still taking about you and still dont know you did them tricks you blew us all away. I would recommend you to anyone! Thank you so much for making our wedding so special ..."
"Hi Nick Thank you so much for Saturday. You were amazing! Everyone really enjoyed it ... Will certainly ask you to entertain us again we so enjoyed it." "Hi Nick On behalf of Andrew and myself I would like to thank you. Everyone I have spoke to really enjoyed your performance. Thanks "
"Thanks Nick, we had a brilliant night and people are still talking about you now! ... Once again a thank you!! Kr"
"Hi Nick Just wanted to say thanks again for Saturday. I got lots of great comments from all the guests, some of them still picking their chins up off the floor!! See you soon. Claire (& Graham)"
"Hi Nick Just wanted to say thankyou so much for last friday. We really enjoyed watching you and we've had fantastic comments from everyone that was there! Your contribution to the evening made Chris and Laura's day that extra special! Thanks again! "Hi Nick, Your magic was fantastic - everyone was SOOOO impressed. I have been meaning to email you to thank you for such a brilliant afternoon, but everything has been so hectic that I have not had time to draw breath yet!! Thank you so much for making the day so special for us all - and I do hope that we have another party that we can have you along to very soon! Many thanks"
"Hi Nick Thank you so much for making our party simply the best we could have hoped for. Everyone is still talking about how great you were and my sons are still trying to figure out the card tricks! " "Hi Nick, Sorry for the delay. I just want to tell you that you left many of my guests speechless and it takes alot for Emma's dad ( my father in law now) to be speechless. Everyone had nothing but positive comments about not only your tricks but the way you approach people, and take the magic away from you, your a really nice guy too. There are so many table magicians out there, but the messages we sent to each other and seeing your website, I just felt I could trust you to put on a good show. I hope not to get married again but maybe look you up when it is our 50th wedding anniversary!!!! Good luck in everything you do Nick and thanks again for an amazing night of entertainment. Cheers"
"Hi, Just wanted to say a big thank you for attending our wedding yesterday. Everyone was very entertained and were talking about it all night, we all really enjoyed it. Thank you again"
"Nick I just wanted to say a massive thank you for entertaining all our guests yesterday. Everyone was so impressed and astounded, you were the highlight of many conversations in the evening. 🙂 Apologies I did not get to see more of you but all the reviews from family and friends were incredible. Massive thank you from myself and Dave! Kind regards"
"Nick all I can say is you were absolute magic! And everyone was still talking about you after you had left I will definitely recommend you to anyone looking for a magician for an event. Once again thank you ,you made our wedding day extra special." Thanks again and all the best, Many thanks"
"Hi Nick Just a little thank you for making my party go so well, everyone was in awe at your magical skills. Hope to be able to use you again sometime best wishes"
"Hi Nick All anybody has been talking about since the wedding is you! You were absolutely fantastic and we are so grateful to you for making our wedding that little bit more special! Thank you! ... If I hear that anybody is looking for a magician, I'll be sure to recommend you. Thanks again "
"Thanks Nick. Richard and I and all our guests really enjoyed your magic and mind reading! Thank you so much, you were brilliant ... Many thanks"
"Hi Nick, Had loads of fab comments about how great you were (suspect you may get some more future bookings too) ... Thanks again for coming, you really helped set the tone for the day. Nat and Steve"
"Hi Nick, Just wanted to say thank you for your brilliant entertainment on Sunday. All our guests were amazed by your tricks and were still talking about them the next morning at breakfast! Many of them wanted to know where I found out about you so I have referred them to your website. Anyway many thanks again for making our party so successful." "Hi Nick, I just wanted to email and thank you for performing at our wedding on the 11th April. You really made a perfect day very special and guests have raved about your skills. I apologise for the delay in sending this email but we've only just got back from honeymoon in Australia. Martin and I wish you every success for the future. Best wishes"
Joanne Shadbolt - Wedding, 11th April 2014 at The Rising Sun, Hope Valley. "Thanks Nick - We were all so impressed ... Thank you for making the party extra special"
Clare Warr - 50th Birthday Party in Prestbury, Cheshire sk10. "Nick, many thanks for performing at my daughters wedding on sat 19/4/14. Both Gill and I were delighted you came and entertained all the guests, everybody I talked to through the night and next day were absolutely thrilled with with the magic you performed and how pleasant and friendly you were. May I wish you well for the future. Once again many thanks. " "Nick Thank you and thank you for attending our wedding . The guests thought you were fantastic and you made a lasting impression for sure . Thank you so much Best regards"
"Omg thank you so much you wowed everyone!!! They were so impressed, and talked about you lots!!! Fantastic. Thank you once again! Carly buck!!!!!!" "Hi Nick ... you went down an absolute storm! Conversations went on long into the night about HOW you were doing what you were doing, really incredible stuff! I will of course be passing your name on to anyone proposing an event. Thanks again"
"Dear Nick, Just wanted to let you know how impressed James & I were with all you did at our wedding. You were excellent! Everyone thoroughly enjoyed all your tricks. Thank you for helping make our day so special! Every good wish James & Derith "
"Hi Nick, Sorry it has taken awhile to send this email. You came to our wedding on Thursday 23rd January, and i just wanted to thank you for entertaining our guests so spectactularly! Everyone really enjoyed your magic, and your tricks are still a talking point when we meet up with our friends. I will be sure to recommend you! Wishing you all the best, With thanks and gratitude,"
"Hi Nick Firstly thank you for a frankly gob smacking show on Saturday, I can honestly say that everyone you entertained was awestruck. Not only will I certainly use your services again but I'll recommend them to everyone I know.... Thanks again Nick Kind Regards"
"Nick Thank you so much for Friday night at Emily's 21st Birthday party. You were a real success every one was talking about how amazing your tricks were. Thank you so much you really made the party an event to remember. Kind regards"
"Hi Nick, A little late, but thanks very much for entertaining us. We got very positive feedback - all enjoyed it and one potential booking in the offing. Happy Christmas! " "Hi Nick, Just to give you some feedback! Everyone enjoyed your magic very much. It added another dimension to the party. Thanks so much. Wishing you a Merry Xmas and Happy New Year. Regards, "
"Hi Nick, Just a quick email to say thank you so much for performing at our wedding at Stapleford Park. All of our guests were astounded and haven't stopped talking about you since! Really glad we chose you over anyone else, as you were fantastic! Many thanks"
"Hi Nick Have popped some feedback on your Face Book page, thank you so much everyone commented on how fab you were!! " "Dear Nick, Thank you so much for your wonderful performance at Vic's party. You really wowed all of the guests and even at the end of our wonderful evening they were still buzzing when talking about 'how you do it'. I hope that we can have you again one day so that I can stand and watch a bit more. I was so busy making sure that everyone was involved. Alex and Vic spent yesterday marvelling at your skills. We have seen other magicians before but you were definitely the best! Many many thanks Nick. Regards"
"Hi Nick, We both just wanted to thank you , we had a great day and your performance was just brilliant all the guest were thrilled and you really helped make the day memorable. We'd def recommend you and if the occasion ever arises we'll be sure to book you again." "Hi Nick, Just wanted to say how brilliant you were yesterday.... Am still a little freaked out by one particular trick! Amazing! Totally added to the brilliance of the day! Thanks"
"Hi Nick Great job on Friday, thank you so much. Everyone was extremely impressed! Craig at unforgettablememories has some fab reaction shots! I'll email you one through now Best wishes"
"Hi Nick Really lovely to meet you on Saturday. Everybody was wowed with you and all a bit speechless! You really added to the evening and gave it that bit extra - thank you. Would certainly recommend you and use you again in the future. Many thanks"
"Hi Nick, Thank you very much again for Saturday. Everyone, ourselves included, was really impressed by you & it definitely added something different to the day. People were commenting on it all evening! The stuff you were doing was incredible! Thanks again Nick. Please keep in touch"
"Nick, I want to thank you, you were brilliantly received and very much enjoyed by everyone!!! The magic you performed was brilliant. A few people have asked me for your name already. I organise quite a few charity events and will certainly check your availability. Thanks again. Dan"
"Thank you very much - everyone said you were absolutely incredible! I couldn't believe how good the magic was. I will recommend you to many people. Thank you for making it a party to remember. I am sure I will be in contact in the near future for more events or people will be who I have recommended you to. Kind regards"
Hi Nick, Thank you so much for entertaining the guests at our wedding (1st June), you have defiantly been a talking point! Everybody was really impressed with what you did. We would Highly recommend you to anyone. Thanks again"
"Good morning Nick. Just a quick message to thank you for Friday night. Your appearance absolutely wowed our guests and your act was incredible. We were all amazed at how you do it and it will remain a talking point for quite some time to come!! l really hope it generates future business for you and I for one will certainly recommend you. Once again Nick, many thanks and good luck for the future." "Hi Nick, We had lots of great feedback regarding your magic, lots of people were amazed at how good you were. I am sure people will keep you in mind if they require a magician. The whole day was really good , the venue was superb and thanks again for attending to make the day even more special. Hope to see you again. Thanks Debbie"
"Hi Nick I didn't see your act for a 2nd time but heard some rave reviews from our friends! Very many thanks... Best wishes,"
"Hi Nick, We had a fabulous day so would like to thank you for helping to make it so special. We had great feedback from our guests, many saying you were the best they had ever seen! So thanks again and hope to see you again in the future. Kind regards"
"Hi Nick, The magic was amazing on Sunday night and thoroughly enjoyed by all.... We are still scratching our heads as to how you did the magic, such as transferring the coins into Carrieanns hands and shaking a card to change number & colour. When I met you in the lobby beforehand and you showed me a few tricks, I knew we were in for some great magic. Having only seen magic on telly before, everyone was astounded at the quality from a live performance. Although we are all aware that magic is an illusion, you definitely made it seem so real. We won't hesitate to recommend you to anyone else we know getting married etc. and also hope that we will be able to book your services again ourselves when a special occasion merits this. Many thanks, "
"Thanks Nick everyone thought you were amazing - still have a card on my ceiling to remember you by! " "Hi Nick Everyone thought you were fantastic! Mom was really, really pleased and thought it was all very good value for money. We would recommend you to anyone. Once again, thank you. " "Hi Nick, I just want to say a huge thank you for performing on our big day. Everyone thoroughly enjoyed your performance and they haven't stopped talking about you! We're just gutted we didn't get to see much of you with being taken off for photographs. Thanks again Nick"
"Hi Nick - I have had fantastic feedback. You were worth every penny ... Everyone was really happy and impressed with your magic and I would recommend you to anyone!" "Morning Nick, Hope you had a good run home. It was great to see you and the buzz around the boarding house when we took Thea back to school was all about the great party and INCREDIBLE magician! A great success all round. Many thanks again and we look forward to seeing you again at a future ‘do’. Best wishes, "
"It was great to have you there, everyone loved you! ... we will keep you in mind and pass on your details to others, Thanks again "
"Hi Nick, Firstly can I thank you for setting the tone for what has been discribed by many guests as the best wedding they have ever attended! You certainly were the talking point for a great deal of the guests who all, without exception, enjoyed your performance, and the family will be using you again in the future. Once again thank you for setting the tone for the evening Regards "
"Hi Nick, Thanks for being at Erika and Matt's wedding - you were brill. Everybody was in awe of your routine - even the younger element. You made towards a very special day being perfect. Thanks. " "Nick did a simply superb job, I think the venue, mix of people and great weather, along with the show Nick put on were absolutely perfect. Everybody is still talking about it ... it really couldn’t have been better.Thanks again Regards "
"Hi Nick ... nothing but sheer amazement at your skills - everyone talking about it throughout the afternoon, and also how pleasant you were with everyone, young and old! Thanks so much, and hope our paths cross again. Best wishes"
"Hi Nick, We had a really good time - people still talking about you this morning! Thank you very much for such an entertaining evening. Best wishes Mike"
"Hi Nick, Just to say a massive thank you for making our day so very special. Our guests thought you were awesome! Still cant get my head round your tricks. Thank you so much best wishes"
"Just a thank you note to say the magician you supplied for our wedding, 7th July in Armitage, was absolutely amazing, he was a lovely guy and totally wowed everyone, we had loads of comments asking where we'd got him from and how good he was. Thanks again and please do pass on our thanks... we've kept the "magic card" from the day, it was the first time I'd signed my new name. Regards"
"Hi Nick Thank you for working your magic on them, you blew everyone away with your tricks. They were still raving about it the next day! If I have a function at work I’ll be calling on your services again, but in the meantime, good luck and keep busy. Best regards"
"Hi Nick Just got back from honeymoon!! We would both like to thank you so much for entertaining out guests during our wedding. Everybody was absolutely bowled over by you and your amazing magic and you made the day very memorable! If we ever need a magician in the future we certainly know where to come! Once again thanks"
Nick You were the talk of the party! Thank you so much for performing on Friday night - everyone thought you were brilliant (not just the kids!!) I had a fabulous night - back to reality now! Hope to see you again in the near future Thanks"
"Hi Nick, Thank you very much, every one enjoyed your magic we had a great day. Alice and Ian are in Vegas enjoying their honeymoon. Thanks again. Kind regards"
"Thank you so much for entertaining everyone so well. You were still being talked about the next morning, so were clearly a huge hit! Lots of your cards were whisked away so hopefully we might even generate some business for you. Anyway thanks again, for contributing to a great bash and I wish you all the best ... "
"Thanks for Saturday - you were amazing, we only wish we had chance to see more of you ourselves!!! Everyone spoke incredibly highly of you and you were a masive talking point. Thanks for mingling with all the different ages and types of people we have absolutely no regrets in booking you and wouldn't think twice about using you in the future or recommending your services, Thanks again, "
"Hi Nick, thank you so much, everyone was talking about you all over the weekend! In a good way,lol. We will definitely recommend you as you were so entertaining. Thanks Again, "
"Dear Nick, Thank you so much for your coming to Matt & Katie's wedding reception. Your amazing performance was everything I had hoped for. Also you were so understanding with regard to timings etc. it made the arrangements very easy for me. 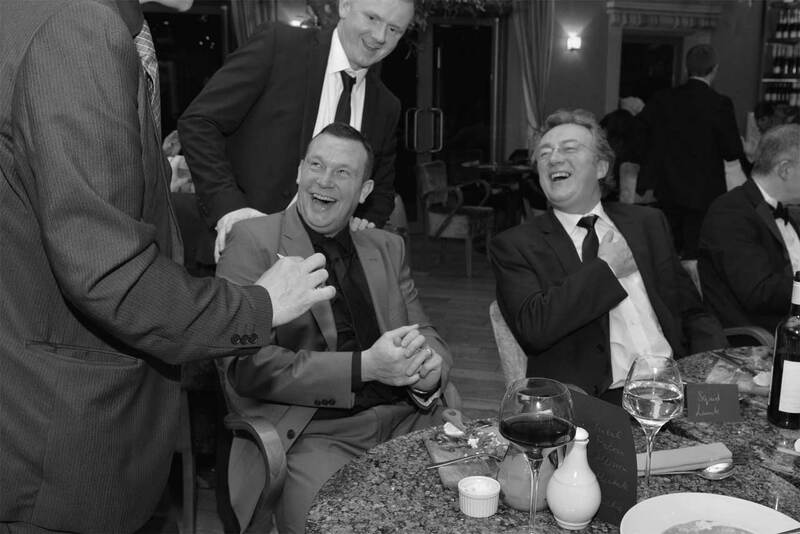 One thing we will remember vividly from the day was the sound of laughter ringing out from each table as you worked your way round the guests. Magical Memories indeed for me and my husband. Matt & Katie were surprised, impressed and equally delighted. Thank you once again Nick!" "Hi Nick Just to say a MASSIVE thank you to you for your outstanding performance at our wedding last week!!! You managed to amaze us over and over again!! You certainly had everybody talking and people have asked about you since!! You are absolutely fantastic and I hope to see you again in the future at maybe somebody else's wedding or even at an event of our own! All the best!! " "Hi Nick Thank you so much for attending our wedding and entertaining our guests. It was a real highlight and everyone loved it. I wouldn't hesitate to use you again and to recommend you. We would be very interested to be kept up to date with any tours etc Thanks"
"Hi Nick Just back from honeymoon...and back to reality! Andre and I wanted to thank you for a tremendous evening of entertainment. Our guests thought you were utterly brilliant and we would not hesitate in booking you for other events or suggesting that our friends and family use you. You added real magic to our wedding day celebrations. Happy New Year to you! Regards, "
"Dear Nick, Huge thanks - you were brilliant, even the hang overs couldn't stop everyone talking about you when they came down for breakfast... Will certainly put your name forward to any friends who are looking for that special entertainment. Again many thanks." "Many thanks for entertaining us with Magic at our 40th Wedding anniversary. The party included guests from 4 to 70 years old and everyone enjoyed the show. I was pleased with the arrangements, liaison with you and your arriving on time and meeting all our requests. I’ll be in touch regarding the 50th Anniversary! Best wishes"
"Hi Nick, Thank you very much for entertaining us all, you were great and everyone had a positive comment to give, we wouldn't hesitate to use your services again and recommend you to other people. Thanks again. Regards"
"Hi Nick, Sorry about the delay in contacting you.......... As your website states, an amazing, entertaining and thoroughly enjoyable session of magic. Not only is the magic you performed, at very close quarters, mind boggling, your interaction with the guests was very professional and friendly. We have had so many complimentary remarks about your input to the success of the evening and I know that at least one person..... the bride....... will be contacting you next year in respect of her company's annual charity fund raiser. Many thanks and best wishes"
"Dear Nick, Stu & I just wanted to write you a short note to thank you for helping to make our wedding such a special day. Without exception all of our guests commented on how talented you are & how having you there added tremendously to the day. We're now trying to think of another excuse to throw a party so we can see you again! Thank you once again with very best wishes"
"Hi Nick, I would just like to thank you so much for your entertainment last night at our 40th birthday party. All of our guests were very impressed and even after you had left we were still all trying to work out how you had done some of the tricks. A true professional. Thanks again"
"The wedding was a huge success thanks largely to the suppliers involved being of such high quality. The magic went down a storm, everyone was impressed and were queuing up to see you! Nikki is having our signed playing card included in the wedding album as a reminder! We cannot thank you enough for your professionalism, punctual arrival and seamless integration into the crowds, the way you manoeuvred through the onlookers to ensure everyone got a turn. We wouldn't hesitate to recommend your services, in fact a couple at the wedding are engaged to be married and asked for your details. Many thanks once again, look forward to seeing you perform again. Regards"
Chris & Nikki Stones - Married 15th August . "Thanks for entertaining us everyone thought you were amazing and went down a treat. Hope to see you again in the future and I will pass on your details. Many Thanks"
"Dear Nick I am sorry that I have only just found the time to write to you to thank you for providing such fantastic entertainment for us at our wedding celebration, 28th July, Hollins Hall Baildon. You really are very very very good!! Everyone we have spoken to have said what a good night it was and how good you were! You are the topic of conversation with all our family and friends!! We would have no hesitation in recommending you to anyone we know & hope we have the pleasure of seeing you again. With our very best wishes & thanks again"
"Hi Nick, We had a fantastic time and lots of good feedback on your magic, my dad still can't understand how you did the invisible deck trick! Thank you very much Nick, you really helped make our day so special! " "It was an absolute pleasure Nick - you were one class act - very well done! Everyone loved your work and I am very glad that you came along. Thanks Nick"
"Thank you so much we had loads of fun and raised lots of money. You impressed many people, I've had loads of wonderful feedback. You made it a memorable night for many people." "Hi Nick, I will definitely refer you on. Many thanks for an entertaining performance – all my guests gave me fabulous feedback." "Thank you very much for the superb performance at our wedding which kept people fantastically entertained. The number of comments we received from people saying how much they enjoyed your magic are simply too numerous to mention! You clearly created a great deal of amazement and wonderment and went down an absolute storm! We certainly would have no hesitation in recommending you to friends and I understand a number of people took your details – hopefully some further opportunities will come your was as a result. Thank you once again. Best Wishes"
"Thank you for adding to the evening, everyone enjoyed the magic and it was a great talking point – well worth the money! Regards"
"We just wanted to thank you very much for helping to make our wedding day at Heaton House Farm on September 21st 2008 a special day to remember. All of our guests have been raving about you ever since and trying to figure out just exactly how did you bend those forks without touching them! You were extremely entertaining, mixing with our guests most of who had never seen a magician at work close up before. Thanks again!" "Just a short note to thank you for your efforts on Sunday. I thought you would also like to know that there were a huge number of those who were in attendance who commented, after you had gone, not only about the very high standard of your performance but also about you as a person - all very complimentary. I shall keep your details for the next time I could do with a bit of magic and will happily pass your details on to anyone else that may be interested in the future. Good luck and, again, many thanks. Kind regards"
"Hi Nick, Just a quick note to say a huge thank you for yesterday, Matthew and I had the most amazing day and you were truly amazing! All our guests commented on your magic so thank you very very much. It was lovely to meet you and shall hold onto your details for future events! Kind regards, "
"Much delayed, but here is a quick "thank you" for your visit to Stanley's party here in August. ... we wanted to let you know how very much we enjoyed everything you did. Human nature being what it is we are still baffled and wondering how it all happened.We have made no progress on that front at all, but that in itself adds to the pleasure. Life is very much to my mind a question of building memories and you have certainly made that party our most special. Sincere thanks"
"Just a quick update to say thank you - we and our guests thoroughly enjoyed your magic. The fork will stay with us (although unused) as a momento! I understand that a couple of guests are already considering how to work you into their special days - we are sure we will meet you again!!! Best wishes"
"Hi Nick You were absolutely fantastic, very entertaining and extremely professional. You added that something extra to make our daughters wedding unforgettable. I would recommend you anytime and we will certainly be contacting you again in the future. Many thanks "
"Well Nick once again your performance was SUPERB we have had such an amazing feedback from our guests and lots of requests for your details!! Thankyou once again Nick and we hope to see you again in the future. Best Wishes"
"Hi Nick, You were the talking point of the party. Today everybody is still asking how you did things and my friend is absolutely convinced of your psychic powers! You were brilliant. Thank you very much for agreeing to be part of what was, for us, an amazing evening." "Hi Nick Thank you so much for the fabulous entertainment that you provided for us and our guests last night. It was truly amazing!! We watched very closely and I have to say that we simply have no idea how you did any of it! It was a real highlight. Everybody will still talking about it at breakfast! Thanks again"
"You really made a great addition to the party - everyone of every age really appreciated your magic. I seem to have a bent fork and a broken one ... do you want them back? We are likely to book you for an Insurance Institute dinner in Bedford .... will get back to you with confirmation. Hope to see you then!! Thanks again"
"Hi Nick: Just a quick line to say thank you very much for keeping our guests entertained at our wedding. The feedback we got was really positive from all our guest, young and old, and they really enjoyed your magic. Emma and I also really appreciated you taking time to show us a trick or two as we were worried that we may miss out! All the best for the future, "
"... thank you, you were excellent, It all worked out perfect, the guests all gave you excellent feedback. I would recommend you with out a shadow of a doubt for any venue or occasion, I might even decide to have a large party later in the year so I will be in touch if I decide to pop on fantastic entertainment like yourself. Once again thank you for entertaining us all." "Still reeling from your amazing talent! People certainly won't forget you in a hurry - it was a pleasure. From my wife & I a big thank you for adding to what was a great day If ever you need a testimonial just let us know. Regards"
Hi Nick, Sorry it has taken us ages to send you this e-mail but things have been a bit manic after the wedding. We just wanted to thank you for the wonderful job you did for us at our wedding at Rookery Hall on the 31st May. We still have guests e-mailing us to say what a fantastic magician you are and we certainly agree. We will definitely be recommending you to our friends and family. With kindest regards,"
"You were certainly one of the highlights of the day for many people and we will definitely pass on your name to anyone who is in search of a magician. Absolutely fantastic, just a shame we didn’t get to see more of you. Take care and hope to see you again in the future." "This is the first opportunity I’ve had to email you to say thanks. 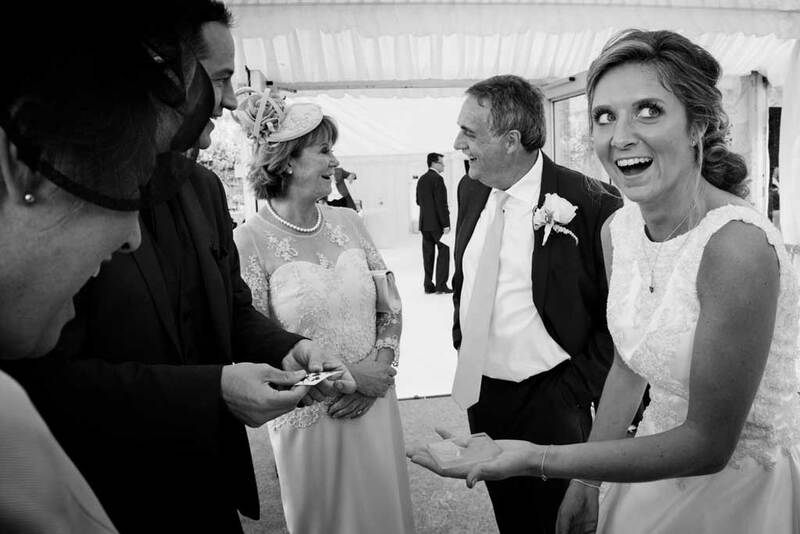 I was initially a little unsure about having a magician at our wedding as I was worried it might be a bit cheesy; but how wrong I was. Having you there to entertain our guests for a couple of hours meant that we could go off with our photographers and have loads of pictures taken knowing that people wouldn’t be getting bored or wondering where we had got to! You were the number one topic of conversation amongst our guests. I would not hesitate to recommend you to anyone in the future and I will indeed forward on your details to anyone who is looking for an entertainer"
"Just to say you were as fantastic this time for Steve's 50th Birthday party as you were for our Silver Wedding Celebration September 2006, yet again everyone thought you were brilliant, I am sure you will be contacted at some point in the future from some of our guests to perform for them. Please feel free to use this email on your website, we could not praise you enough! With very best wishes"
"Just wanted to say thank you for entertaining the guests at our evening reception last Saturday evening (26th April). Everyone thought that your magic was fantastic, Stuart and I only wished we had more time to watch! A great talking point for all of our guests. We would certainly recommend you to anyone and will definitely keep you in mind if we have any future events where we need to amaze guests young and old! Thanks again, Best wishes"
"Nick, I just wanted to say a massive thank you for the work you put into our wedding. Everyone complimented us on 'the magician' ... I've set up a wedding blog and will post your link on there for guests to see how to book you for their own dos. Brilliant show thank you so much." "Nick - Thank you very much for a wonderful night, everything seemed to go like clockwork - for once!! Robin had a great time, and you certainly impressed everyone with your magic - I think you will definitely get some future bookings. Best Wishes"
"Hi Nick, Just a quick line to say hope you got back safely and thank you very very much for a fabulous evening. Your magic was truly magic and of course everyone was talking about your fantastic sleight of hand. The restaurant has just given me a bill for £25 for the forks (which are now going to be exhibited in the McTate gallery of modern art !!!) Absolutely brilliant !!! Anyway once again Thankyou and if you ever need a reference please give me a call. ( though I doubt that you will ever need to). Take care and best regards"
"Thank you for your email. Maureen and I wish to thank you very much for entertaining our guests on Saturday evening. Everybody enjoyed your magic and they were all completely baffled. You made a large contribution to the success of the party. I even managed to enjoy becoming eighty years old! " "Hi Nick, You went down a storm mate!, everyone comments on you when we see them again for the first time after the wedding, you were great entertainment and some of your tricks are just mind blowing, thanks very much for making the 'lull' part of the wedding, one of the best bits!! " "Thanks so much .... we had a wonderful wedding and you certainly helped to make it special for us and our guests. You were fantastic! and we were all left wondering how you managed those card tricks!!? We would not hesitate to recommend you to our friends and family. In fact my sister in law is getting married at Thorpe Park next year, so we will pass on your details to her. Thanks again,"
"We had a wonderful day and I had so many comments about how fantastic you were. I wouldn't hesitate in recommending you and I will certainly be keeping your details for the future. Thank you so much." "Hi nick you were a star, everybody thought you were excellent, and you turned a special day into a magical day all sunday everybody kept talking about you .... I would recommend you at any time. once again many thanks"
"Brilliant night Nick, just fantastic -thank you for getting our party off to a great start. We will certainty keep you in mind for the future and will also pass on you name to other people who may wish to use your talents. Very many thanks"
"Dear Nick, Thank you ever so much for entertaining at our wedding. Sorry it's taken us so long to get back to you to tell you how amazed all our guests were with you (honestly, they haven't stopped going on about it - particularly the card on the ceiling at breakfast - what was that all about?? ), but we've been on honeymoon (it's a hard life being recently married) and then getting back into work and normality. Also, thank you for making us your first port of call after the ceremony - we were so busy we might have missed you otherwise and we're still rather jealous that we had to go and do all those weddingy things rather than be astounded with more of your mind boggling magic! We had some very lucky guests and hope that one day we have the pleasure of being guests at a wedding at which you are performing. Thanks once again"
"Nick I have had lots of texts, e-mails and calls all about YOU! My guests were truly amazed by your talents and many commented on how pleasant, polite and smartly dressed you were. Six different people from a guest list of just 76 have asked for your number!!! I was delighted to pass it on straight away. Truly magical! Thank you for being party of our parents day. Please feel free to add my comments to your web site. I wish you the very best and once again thank you!!! Regards,"
"Hello Nick , We were all absolutely thrilled with your performance. It was highly entertaining and extremely professional and thoroughly enjoyed by everybody. Will certainly be calling on you again! Many thanks"
"Hi Nick Thanku thanku thanku u were amazing the feedback was incredible, everybody was talking about you!!! My nephew & his wife have worked in casinos around the world for 20+ years they are now back in the UK and they said whatever you do do not tell him where we work he will clean us out!!!! We had a wonderful day my daughter said this morning before leaving for honeymoon that her wedding day had been everything she had ever dreamed of. I am sure you could see that she loved every minute. Thanku once again Nick I am sure we will meet again." "Hi Nick Just a quick e mail to thank you for attending the wedding of Helen and Jonathan yesterday. I know that everyone enjoyed it because you only had to look at their faces. Today we had a few friends and family around for a 'wind down' barbecue and you were the topic of conversation several times - everyone saying how wonderful you were. So thanks again for making the occasion so special." "Hi Nick ... We had a fantastic day and would like to thank you for everything you did to make our day so special. You certainly amazed our guests with some truly outstanding magic. Everyone commented on what a nice touch it was at a wedding and how much they enjoyed it. I am sure if we have functions in the future we wouldn't hesitate in asking you to return and we will also certainly recommend you to anyone looking for an entertainer in the future. Thanks again and we hope to see you in the not too distant future. Kind Regards"
"Nick, thank you so much for helping make our wedding such a success. We have had so many comments from our guests as to how good you were and what a great idea it was. We have lots of requests for your contact details so hopefully some will follow up. Thanks again for amazing us with your magic and for being so professional and fun to have around...."
"Hi Nick, All the guests were very happy with the entertainment you provided and you are still the talking point. You are an excellent magician and you will be recommended to anyone I know who will be having parties. You are very professional, well mannered and very smartly dressed 🙂 Myself and Mark were very impressed. Thanks again. Warm wishes"
"Dear Nick, Thank you for your magic on our wedding day. We all enjoyed it very much!, smashing!. My Mum said you were great with my little brother too. It's things like that that people do remember and you got some great feedback. Thanks again and good luck doing what your doing, making everybody happy 🙂 Best Regards,"
"Hi Nick, Thank you for coming you were Fantastic I had many great comments and would not hesitate to recommend or book you in the future THANKS AGAIN!" "Just to say once again, Nick, thank you for all the hard work on Friday night at Andrew's do... you were the talk of the evening and have a large number of fans up here - I am only sorry Robert and I didn't manage to get to see more of the tricks everybody is enthralling over! I will keep hold of this address and you never know we may be in touch in the future. Thanks again,"
"Hi Nick, Thankyou very much for entertaining us at our wedding, you were a hit and if anyone i know needs a magician i will recommend you any time. Thanks again for making our day even more special and fun. Kind regards,"
"You went down a storm. Everyone rushed to tell me how cool you are. You are a legend! Im more than happy to recommend you to anyone, in fact one of the guests should be contacting you about a possible booking for her blokes leaving do as a surprise. If you have a forum or a book to sign or anything I'll leave you the best review ever! Thanks for contributing to our fantastic day, you helped considerably." "Nick Everyone loved the magic – they thought it was a really good idea to have you there to entertain them as Amy and I got dragged around the castle by the photographer! It added to what was a fantastic day. Thanks again Alan"
"Dear Nick, Thank you very much for entertaining our Guests at Rebecca's Wedding last Saturday. Everyone we spoke to during and after the Wedding said that they thouroughly enjoyed your close-up hand magic and your relaxed sense of humour. You were a tremendous success and I am still trying to work out how you made that £2 coin disappear! My wife, Diane, was so thrilled with your performance that she is trying to arrange another event, just so she can book you to entertain us again! Thank you once again We will be in touch Best Wishes"
"Hi Nick, Sorry it's taken so long in getting back to you, we have only just started to get back to any form of normality! Thank you so much for the fabulous job you did at our wedding, we have heard nothing but compliments many of which saying that you are the best they have ever seen! Again thanks for helping to keep everyone smiling." "Nick Many thanks for Saturday night – you were a big hit!!!" "Dear Nick Just a quick note to thank you for the great entertainment you provided at our son Matt's 21st on 26th August. Everybody thoroughly enjoyed the evening and were amazed at your magic skills. Well done & thank you. Regards"
"Nick -just a quick line to say thanks for your apprearance on Saturday night - everyone was amazed by your performance, and it really made the party special! Best Wishes"
"Hi Nick. Thanks again for the fantastic magic you did at our wedding. Everyone was commenting on our great you were. When Ian thanked everyone in his speech, he also mentioned yourself and commented on how good you were, which was then followed by all guests saying 'yes - how brilliant'. All the comments were positive, mostly with people saying 'how did he do that'! You really made our day so special and we are so pleased to have chosen you. We will highly recommend you to anyone else looking for some magical entertainment at a function. You never know, we may ask you back to entertain at one of our parties. Hope to see you again.Thank you again. Regards"
"Just a quick note to say thanks for entertaining our guests at our wedding party on July 22. You were absolutely fantastic and people are still talking about your magic – which wowed everyone. Best wishes"
"Thank you for an amazing show of magic. We were blown away and baffled by all the tricks you did, as was everyone else we spoke to (we still can't get over the 'card on the roof' trick!). Hopefully that won't be the last time we see you! We'll certainly recommend you if we hear of anyone else getting married.Thanks again,"
"David and I want to thank you for the superb magic you provided at our wedding celebration. Everybody was astounded and really impressed and still talking about what you did. Regards"
"I would just like to say a huge thank you for doing such a fantastic job at my party on July 1st. Everybody was so impressed with you and the standard of magic that you performed. Since then a lot of us have all been trying to work out how the tricks were done!! The party surpassed my greatest hopes and I have had loads of letters from people who were so impressed with you. I have given your details to quite a few. Once again, thanks for everything. I am sure you'll go on to great things! Kindest regards"
"Just a little note to thank you for the "magical" edge you added to Celia's and mine recent wedding. Everyone has commented on how you dazzled them with your array of tricks - most are still trying to work out how on earth you did it! You certainly added to our perfect day. Many thanks again, will certainly be recommending you to others!" "Thank you very much for last night, I don't think it could have gone any better and from the sound of the applause you received and what people have said to me everyone was very impressed. I think a good number of tables and people had the chance to watch you perform and that what you did was very good. Thanks again"
"Thanks for your brilliant performances at our daughter's Wedding on Saturday. Everyone was really impressed and you made the occasion much more enjoyable for our guests. We will certainly be recommending you !! Thanks again"
"I can honestly say that people thought it was a brilliant addition to the day. My mum has not shut up about your magic since and loads of my mates who I thought would take some convincing were well impressed. Only yesterday a few of us were round at a friends with someone that wasn't at the wedding as she was on holiday, and the girls were telling her all about the tricks that you were doing. The discussions that you provoked still going on over 2 weeks later tells its own story I would say! Thanks again"
"Cheers for the performance it was great, everyone loved it. I would (as would all who saw you) recommend you to others for their weddings or any other party/celebration. Best night ever. Thanks again"
"Thank you very much for your contribution to Susan's wedding. Your performances were a great success and were discussed for some time afterwards (no one could work out how you did it, though). Several people mentioned what a good idea it was to have a magician at the reception. You were perfect! Thanks again." "Hi Nick, thanks very much for your performance at our wedding, everything you did was perfect, the timings, the act, BRILLIANT, you kept people talking for most of the night. will definitely recommend to anyone thinking of doing similar. Many thanks"
"Thank you so much for your entertainment - you were absolutely fantastic - people are still talking about you and how amazing your tricks were. People have also commented on how lovely you were and how nothing was too much trouble - taking the time to show the bestman some tricks when he had missed you, and taking the time out at the end to show Paul and I one last trick - I hope you got the card back down from the ceiling!! We had a wonderful day - and our guests thoroughly enjoyed the magic show - my feedback would be 'keep doing more of the same'!! We will definitely keep you in mind for future events... Thank you again for entertaining us & our guests"
"You were fantastic! It has been so enjoyable listening to our guests excitedly tell us about the magic you performed for them. Thank you for making our day something unique. You are such a friendly chap and everyone said how professional you were, I will certainly recommend you to anyone and everyone! Thank you so much Nick"
"We were so pleased we booked you for our wedding, everyone loved your performance and we have had many comments about how good you were and how you got round so many of the guests. Thanks again for helping make our day so special and memorable. Regards"
"Thank you very much for entertaining the guests at my birthday party last Friday. Everyone I have spoken to since then has nothing but admiration and praise for you. Everyone was amazed by your magic. Hopefully see you again in the future, kind regards"
"Your performance was amazing, I really don't know how you could improve on it, people were blown away. People are still talking about your performance now. My husband was some what of a sceptic before he met you but he has no explanation for what you do. Thanks for helping to make our wedding day so special and perfect, and one people will remember for a long time." "Thank you very much for entertaining us and our guests at our wedding reception last Saturday night. Everyone who we have spoken to since was amazed by your performance, they all thoroughly enjoyed it. That was the second time that we have seen you and again your performance was 1st class. We were talking about you for 12 months previous to the party and I`m sure many more will be for a long time. Thanks again for a great nights entertainment, hope to see you soon." "Thank you very much indeed for the splendid job you did in entertaining our guests at Hassop Hall on our wedding day. Everybody commented on how amazing your tricks were and I am glad that I got the chance to see you in action too! .... it wouldn't have been the same without you. Thank you once again." "Just wanted to let you know how much we appreciated your performance on our wedding day. You went down a storm, esp with the Americans, and so many people have said what a good idea it was to have a magician. My father was particularly impressed with the autographed playing card trick!! Ryan and I would really like to thank you for all your efforts at making our day so special, it was great having you there and part of our day. I have attached some pictures for you just to show you how much people enjoyed having you there! Best wishes for the future and thank you again." very special. I also want to thank you for being so flexible on the day - we are really grateful that you stayed on, even though we were running so late. Kind Regards"
future. We can definitely say that we 'Witnessed the Magic'!!!!!" "You were amazing as ever, people talked of your performance for days. You are so professional in your work ... thanks for making the evening, regards to you and your lovely wife"
"Thank you Nick for a wonderful display of magic. Your performance was outstanding and enjoyed by us all! Best wishes." "Just a quick note to thank you so much for performing at our wedding - you were superb and have been the talk of the day since! From our first contact to the wedding your professionalism has been outstanding and on top of that you're a really nice guy. We would definitely recommend you and hope to be able to use you again in the future. Thank you again for adding to our perfect day. Best wishes. "Thank you very much for attending our wedding and entertaining everyone. We received many comments on how brilliant you were and saw for ourselves on our video! Very Magical! Thanks again and best wishes." "Thank you so much for your 'amazing performance' at our wedding on 7th May. You totally astounded our guests!!! Thanks again, we hope to book you for a function in the future!" "Just wanted to say many thanks for making my sister's hen night so special on Saturday. You were the highlight of the evening and everyone was amazed by your routine. You pitched the delivery just right and made Louise feel very special. With very best wishes for the future and I'll keep an eye out for you on the TV!" "So many of our guests have been telling us how fantastic you were! We are recommending you to everyone, as are our guests! Thank you again Nick, you are so professional in the way you have communicated with us and our guests. Wishing you loads of luck for the future." "... a huge thank you for being so brilliant at my party. Every single person, without exception, commented on your exceptional skill. I think that says not only how good you are, but also that you did manage to work the whole room very successfully. One comment I got on e-mail was 'I don't know how the magician did what he did - he was so good it was spooky! I should say that also everybody noted your friendly and easy-going manner which was also a real ice-breaker and brought groups together, which was great for the party. You really did make it a night to remember for all the guests and therefore for me, basking in the reflected glory! Without a doubt, your presence was the highlight of the evening." "Everybody commented on how great you were and we have given your details to quite a few people! Hope you get some more business from them. Steve and I were really impressed and wanted to say thank you very much for helping to make our day so special - we're just trying to think of another reason to have a magician - maybe an anniversary in the future." 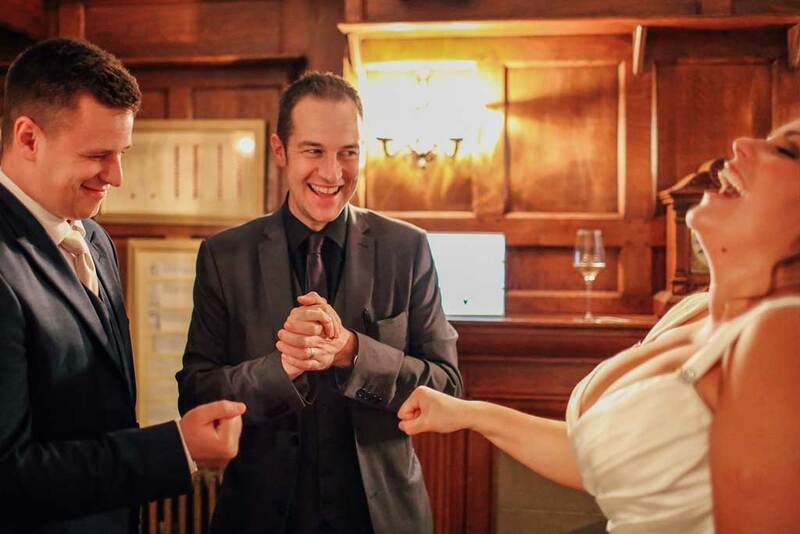 "A huge thank you for entertaining our guests with your magic at our wedding. You are unbelievably talented and our guests were really impressed with your magic. I wouldn't hesitate to recommend you to anyone else who is having a celebration, you really made our dinner go with a bang - superb!" "We are writing to say a BIG thank you for your performance at our evening reception last Saturday night. It was absolutely amazing. All our guests have talked of nearly nothing else since. We were impressed by your professionalism and skill. And we still don't have a clue how you did any of it!" "Thank you Nick, you made all the difference to our day – everyone was in awe of your performances around the room, and you made for a truly fantastic day – Thank you. If there are any other events that we have where I can request the pleasure of your company again I will do so, and would not hesitate to recommend you to others for any sort of celebration. Thank you again for adding to the memories of our special day." "A sincere thank you again; you really added a special touch to the night & lots of guests have already given really positive feedback.... we wanted to be a bit "different" and I am certain your presence added to the atmosphere. We had a fabulous day and now have so many happy memories. Thank you again, very best wishes..."
"Thank you so much 'adding the magic to our special day'. Absolutely everyone enjoyed what you did and we have had loads of comments since."